Why and how to support the BGDC? 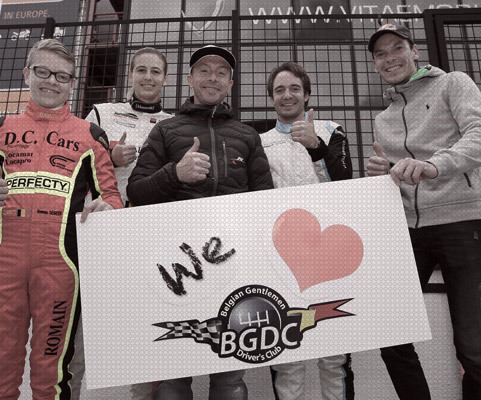 The BGDC is a Belgian association set up in ASBL (N ° 0817576178) which was founded in 2009 by a small group of enthusiasts with the aim of promoting motor sport on Circuit. On the strength of their long-standing experience in the racing world, with an excellent reputation and a very good knowledge of the sport, the leaders of the structure have used their experience to create the framework, regulations And the necessary promotion that allowed the club to gain recognition by the National authorities for 6 years (The Royal Automobile Club of Belgium) and International (FIA) since 2016. The main activity of the Association is the Promotion And the organization of endurance events for passenger cars and modern GTs on circuits both in Belgium and in neighboring countries. The BGDC addresses itself as a promoter of its own series to pilots, owners or teams managing one or more racing cars by enabling them to enter the events. The theater of the activities are or were mainly the Belgian circuits of Zolder, Spa-Francorchamps or Mettet but also Dijon (F), Val de Vienne (F), Zandvoort (NL), Assen (NL). Each year, there are 6 to 8 weekend races where the BGDC occurs but where also the BGDC organizes for third competitions. In 2017, BGDC entered a large organization at Spa Francorchamps whose flagship event will be a 400-minute endurance. The team also organizes competitions ensuring general coordination with the subcontractors & volunteers, the sports management and the execution of the contracts with the reception structures (Circuits). We are constantly seeking partnerships to strengthen our structure and develop the quality, size and visibility of our concept. This can be a major, exclusive partner that can be involved in the decision-making bodies. We are also looking for occasional sponsors or supporting a well defined project, such as transport, stewardship, temporary structures on site, accommodation of staff, services ... without this list being restrictive. We offer visibility on race vehicles, flyers, banners, bows, websites (300 unique visits / day), moderate Facebook pages (3300 targeted Fans), videos, teasers, live streaming on the internet, reviews, press releases Developed by professionals and widely relayed in the specialized media, mainly in Belgium, both in the north and south of the country. Do not hesitate to contact us in order to develop a partnership plan adapted to your communication strategies, your size and your wishes.